In what is probably his most gay-friendly statement to date, Pope Francis said that he will not judge gay priests, and he respects their vocation. This is probably the clearest break with his predecessors John Paul II and Benedict XVI. Benedict issued an instruction to bishops not to accept gay candidates for the seminary, a policy that was being considered under John Paul’s papacy. “The Catechism of the Catholic Church explains this very well. It says they should not be marginalized because of this (orientation) but that they must be integrated into society. The pope was answering a question about his statement last month concerning a “gay lobby” in the Vatican, so his reference to lobbies above probably refers to that context. “Reporters on the plane said that the pope had been candid and high-spirited and didn’t dodge a single question, even thanking the person who asked about reports of a ‘gay lobby’ inside the Vatican, and about Italian press reports that one of the advisers he had appointed to look into the Vatican Bank had been accused of having gay trysts. Many people have been waiting for a clear message from Pope Francis on LGBT issues, and it seems like this one indicates he will take a decidedly different approach than his immediate predecessors had done. Some will say that this is not enough, that he still refers to sins of homosexuals, but I think the important thing is the question of emphasis. While his predecessors emphasized sin in relationship to LGBT people, Pope Francis looks like he will be emphasizing human dignity, respect, and social integration. Even if he doesn’t drop the sin language, this is still a major step forward, and one that can pave the way for further advancements down the road. Clearly, Francis is changing the tone on several issues, gay priests being one. The real test will be whether he instructs seminaries to disregard the sexual preference of candidates for admission. The shift in emphasis is crucial. ThThere is in fact absolutely nothing new in this – it’s all absolutely standard, orthodox Catholic doctrine, which contains two parts. There is a compassionate side, directing that we should be treated with respect, compassion and sensitivity, and protected from unjust discrimination, and from violence or malice, in words or in deeds. Then there’s the harsh side, denying absolutely any hope of physical expression of our loves in genital acts. The problem has been that many bishops, and the previous two popes, have ignored or directly flouted the compassionate parts of teaching, focusing exclusively on the harshest bits. Francis is not in any way signalling a shift in actual teaching – but he is introducing some sorely needed balance. That alone is welcome. For the first time since 1978 I feel happy with the pope. I still cannot trust – I have been hurt too many times, but Pope Francis seems like the real deal. As with so many watershed issues, there is always further to go toward justice in our world but it cannot be denied that this is a turn for the 2000 year old ocean liner called the Catholic Church. As one who opted to stay and work for justice and equality, I am heartened and even encouraged by Pope Francis’s comments today, in a way I have not been in my entire adult life (nearly 30 years) as a gay Catholic. I have been watching him and listening to him carefully since he was elected, sensing from the first day that he was a revolutionary and that this was where was headed. Although I have reserved comment until now, I will applaud him on this. The sin language is always disconcerting, in the liberal Catholic circles I have been worshiping with for the last 2 decades, we don’t hear or use that language regarding any subject. So that is hard to take and especially in this context. Instead, we talk about “sin” as separation from God. So, if we view his comments from that perspective, Pope Francis’s statements today are in direct contrast to the conservative notion of “sin” since he is opening his arms and the doors of the Vatican to gay people. Is where we are today, we want to be yet? Of course not. But my faith and my religion are a birthright, they are a cultural tradition felt and shared deeply by me, my family and my loved ones for generations, not to be taken or lost lightly. Have I struggled within that tradition? Profoundly. Nonetheless, given the Church’s stance on the GLBT community until now, these comments strike me in much the same way the early talk of gay marriage did – I did not dream it in my lifetime and I am hopeful and gladdened. Let us continue to pray for Pope Francis. And lest I neglect the equally as enormous gender issues, his talk about women today has pierced the heart of another of the Church’s ills. Perhaps we are on the road to healing on several fronts? I heard that exact same fear expressed at Mass this morning, shades of John-Paul I. This just goes to show how far our church has fallen since Good Pope John XXIII. I live in San Francisco in an inclusive Catholic parish in the middle of the Castro. (MHR) I wonder if this signals a change in direction and if it will make any difference to our homophobic Archbishop Salvatore Cordileone. 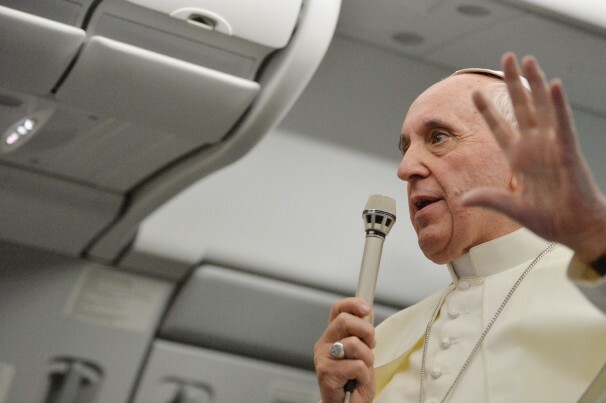 Indeed, I heard the press reports of the Pope’s “no holds barred” 84-minute press conference on the plane, and I was totally amazed and uplifted. The one big “fly in the ointment” is his declaration that Pope John Paul II had made an “infallible” pronouncement that women can never be ordained to the priesthood, and so the matter is settled. Well, not so fast. I’d love to see a scholarly historical analysis of situations in which subsequent Popes have rescinded or modified the pronouncements made by previous Popes. I believe it happened in terms of lowering the qualifying age for First Communion, in order to make it available to children, which took place under Pope St. Pius X. At the very least, Pope Francis should move to open the ordained permanent Diaconate to women — since this is completely precedented in Church history. During the first millennium of Church history, women were allowed to become deacons — and so there’s no sound reason why this well-precedented practice cannot be restored…immediately!